There must be a fair amount of friendly rivalry between the onsens in neighbouring prefectures of Kyushu! Last year,two onsens in Oita prefecture pipped Kurokawa Onsen to the post,forcing it into third place in this contest run by Kyushu Tourism. Currently,Kurokawa Onsen (Kumamoto Pref.) is in second place with 239 votes,a bit behind Yufuin Onsen (Oita Pref.) with 278….voting runs until January 15th ,2017 so there is still time to cast your vote and send the link to friends or relatives who have also visited Kurokawa Onsen. (Foreign tourists in Japan or overseas may vote,the contest prize is a pair of vouchers towards a one-night stay in an as-yet-undisclosed inn in Kyushu). Just click through on the heart mark of your chosen onsen (KUROKAWA ONSEN of course!) and that takes you to a second page to VOTE and enter your details if you would like to be entered in the prize draw. to cast your vote for Kurokawa Onsen! Unfortunately a wet and cloudy one,but we expect better weather on Sunday,November 6th this year for our biannual hiking event. This time,we are planning a course of approximately one and a half hours,uphill but not a difficult walk. Lunch,a bottle of water and free entrance to one outdoor bath is included in the price. 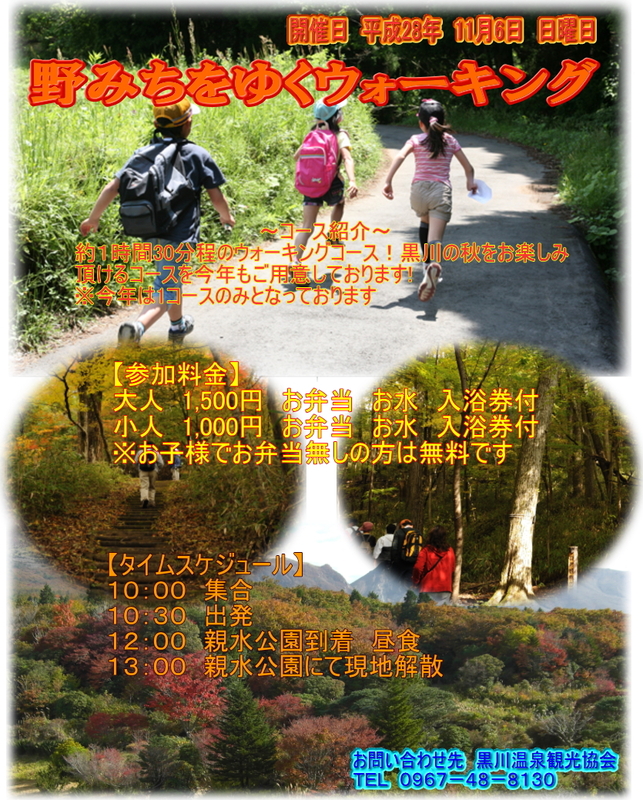 At 1pm,after lunch,you are then free to return to downtown Kurokawa (on foot). November 1st Event: 2015 Rice Festival in Minami Oguni UPCOMING EVENT `Onsen Festival` October 7th and 8th, 2017 UPCOMING EVENT `Onsen Thanksgiving Festival` October 1st and 2nd,2016 June event: Free bathing on June 26th!